Welcome to step by! Welcome to Hot Pot lover Elaine’s little corner! Hot pot or also known as Chinese fondue is always my favorite no matter in hot summer or cold winter. In China, hot pot has a history over 1000 years and until now, it is still the most popular dish for social or family gathering. Elaine will introduce Hot pot from the following sides. As I mentioned before that hot pot has more than 1000 years of history. It firstly appeared in Mongolia area and then became popular in South part of China in Tang Dynasty. And now it becomes quite popular in China and people from different areas spread their own types of hot pot out. Then do you know where the hot pot city of China is now? The hot pot city is Chongqing, a municipality under Sichuan area. And I believe that many people like spicy hot pot very much. Spicy hot pot is a quite unique type of Sichuan cuisine. Firstly, the taste and flavor is succeeded from Sichuan cuisine including many seasonings used. 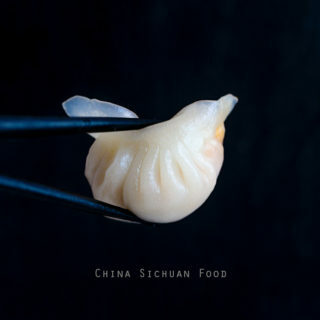 However it is not the same with commonly Sichuan dishes. Anyway, hot pot is originated from Sichuan and quite popular in Sichuan area. Chinese hot pot has it own flavor and design according to different area, which is also determined by different weather conditions. The most famous type is known as Chongqing hot pot, also known as Sichuan hot pot(to understand the relationship, refer to Chongqing and Sichuan). It is featured by the herbs and spices used in the soup base. The next is the worldwide popular Mongolian hot pot in Northeast China Region. In north China, there is famous Beijing lamb hot pot (涮羊肉)also known as mutton hot pot.Following is a picture shows about eating lamb hot pot. For more about Beijing Hot Pot. In south china such as Guangdong, people are more likely to have seafood hot pot and Hong Kong beef hot pot. In central part of china, people like to have venison stew pot. Besides, new versions of hot pot become popular across the whole china including “Three fresh pot”(三鲜火锅) in Hangzhou and “Mixed hot pot” in Shanghai province. Following are some other hot pot pictures not included above to enjoy, please note that the pictures are not photoed by Elaine. I search them on search engine so that I can share you more information about hot pot. I will list my pictures in specific recipe post. 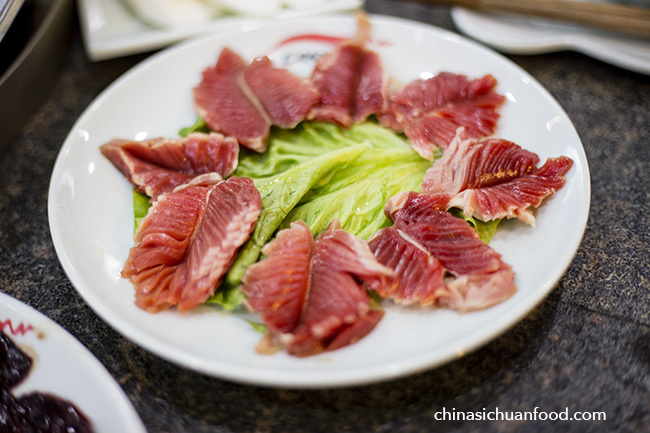 This is a Fish hot pot which is quite popular in Sichuan province. The fermented vegetable used in call Sichuan Pickled Vegetable (四川泡菜). Now, dry pot is considered as a new type of hot pot in China. For dry pot, no soup base is added at the very beginning but it can be added after the meat ingredients are eat out. Generally, shrimp, ribs, chicken, fish ribs are excellent ingredients for dry pot. Additionally, dry pot can also be made only with vegetables. I will expand this in my post–dry pot. Additionally, Chinese hot pot is also divided into four types based on soup base and whether ingredients are cooked or not previously. This first type is with light soup base and mainly using method of instant-boil(涮). 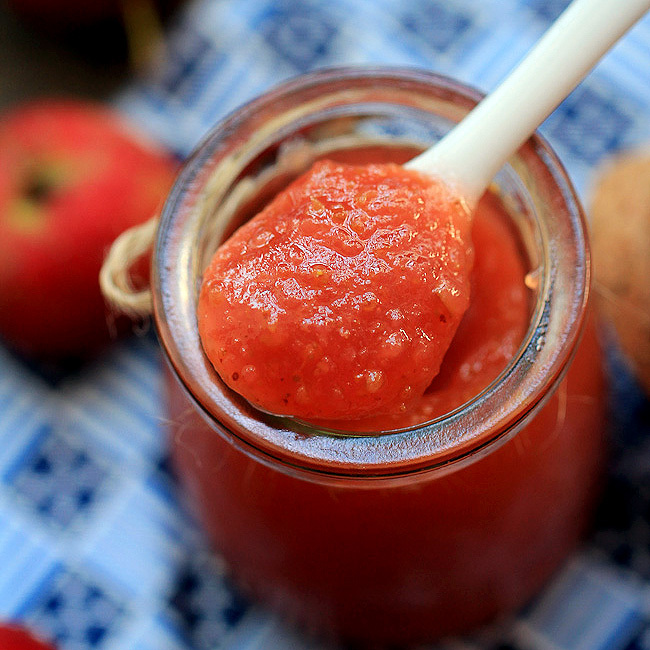 For this type, dipping sauce play a really important role, since dipping sauce is mostly the sauce of flavors. Instant-boiled mutton hot pot and Guangdong (Hong Kong) hot pot belong to this group. The second type is with cooked main meat ingredients such as fish or mutton. The pot is mainly used to keep the temperature and instant boil vegetables. Meat flavor certainly matters a lot and meanwhile you can enjoy the faint scent of vegetables. Famously fish hot pot, Chicken hot pot belong to this group. The third type is with all cooked ingredients not only the meat such as chafing dish. Pot is totally used for keeping it warm. Three mixed hot pot belongs to this group. The last type is the emphasis on the soup base and dipping sauce at the same time. Soup base of hot pot is stock boiled for a long time. 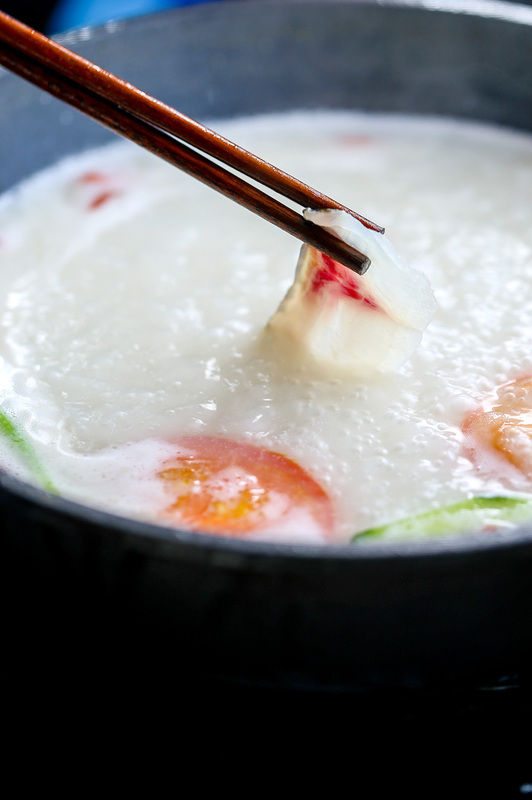 Various flavors come from directly from dipping sauce and indirectly from soup base. For example, Sichuan spicy hot pot or seafood hot pot. 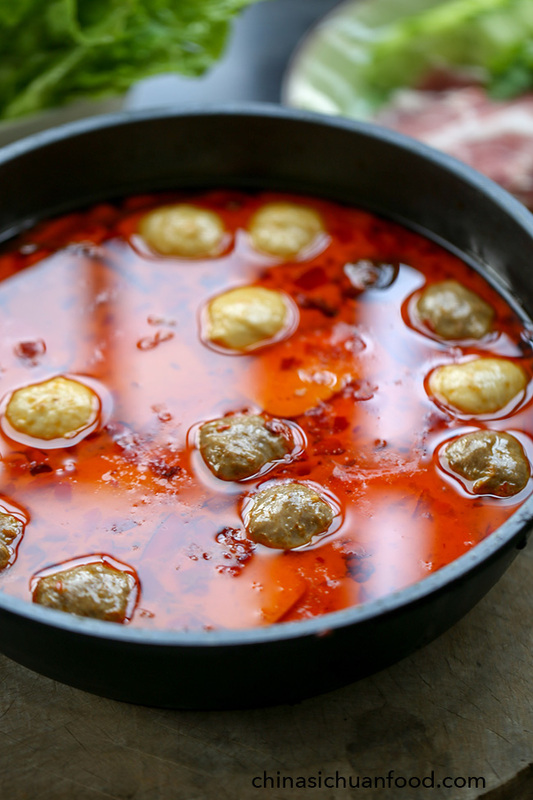 Since hot pot is an ideal and easy meal for social gathering. Then what are the essential parts to make hot pot at home? Then there are three essential parts for hot pot: soup bases, main ingredients and the dips. Making hot pot soup base is quite important for a successful hot pot. You can surely purchase one package directly from supermarket or any online store or be brave to make one at home. 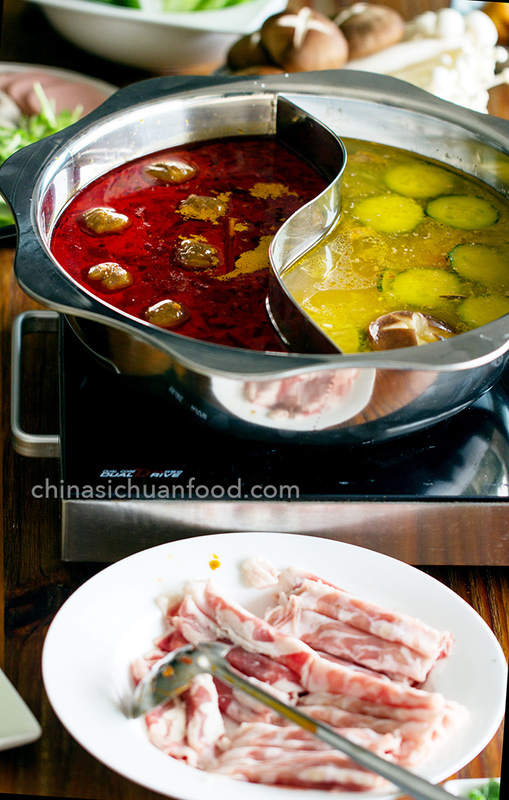 Generally, there are three types of soup base in Chinese hot pot but any two are commonly used in Sichuan hot pot. (The third type not used in Sichuan hot pot is bland soup base, which is mainly used in Mongolian hot pot or Beijing hot pot). 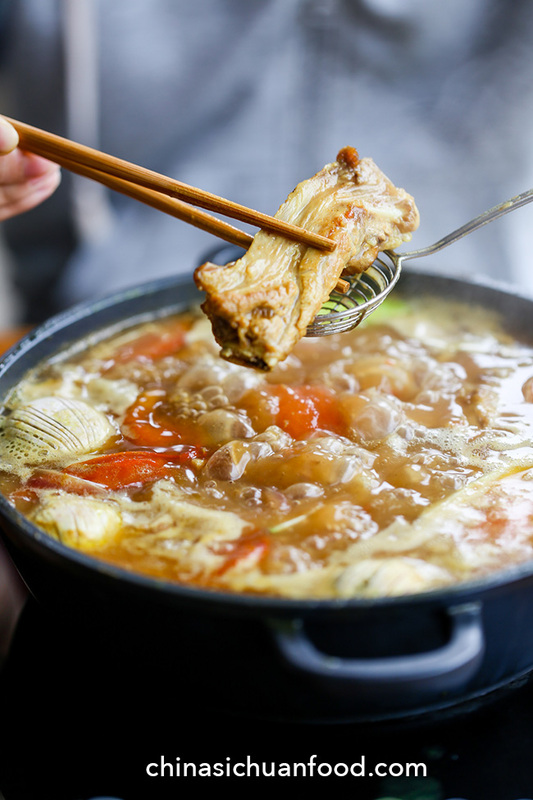 If you decide to purchase the soup base for your hot pot, then that’s a time-consuming decision. How about we try to make one at home. The first step we should do is to make a clear broth, which will further added with other spices like chili pepper, doubangjiang and sichuan peppercorn etc. For details about how to make a soup base at home. Usually when I serve my family with hot pot, I prepare both spiced version and mild version at the same time. There are hundreds of dipping sauces attached to Sichuan hot pot, mainly with the following seasonings and condiments. 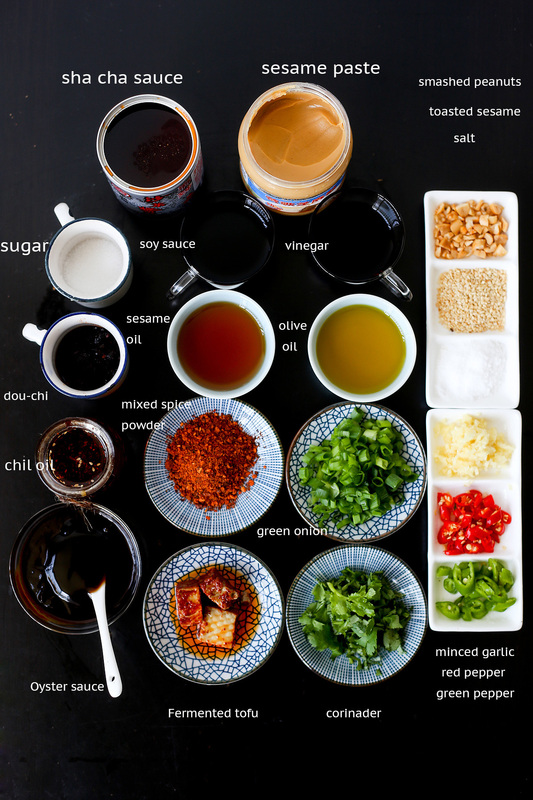 Soy sauce, sesame oil, chili, sesame butter, pickled tofu, Sa cha sauce, vinegar, hoisin sauce, peanut butter etc. Following is the sauces I usually prepare for a large family hot pot party, trying to be appealing to everyone. Some of the process of making dipping sauces are blending seasoning together. And there is still a way of stir-fry the dips. I will introduce later. I have collected some of most practical hot pot recipes in my cookbook. 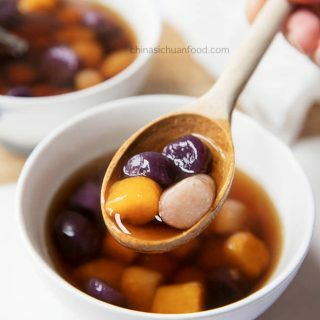 Want to make yummy and unique hot pot at home? Get it and start today. Wow – I’m so glad I found your site. I’m now looking forward to making hot pots this winter. I hope you enjoy my hot pot recipes. I make different types of hot pot almost every week. All of them will be posted on this site. Wish you come back and check them. I’ve been searching for Sichuan hot pot recipes for quite sometimes now. I even asked my friend to bought cook books back for me from china but I still don’t understand much about Sichuan’s ingredients like different types of chili, how its to be used and other specific ingredients such as different types of “jiang”. 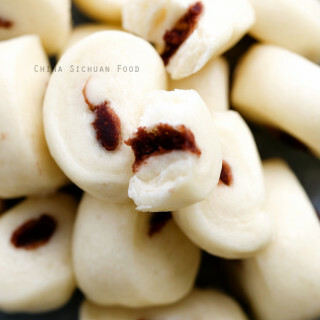 I would like to ask if you could teach me more about Sichuan’s ingredients and instruction of how to cook Sichuan hot pot from scratch or any other Sichuan dishes? I kinda addicted to Sichuan cuisine. Thank you in advance 🙂 btw, I really really love your site. Thanks for stopping by. You are right that the chilis used in hot pot is various and a little bit difficult to understand them. I will write a detailed post introducing the chilis used in hot pot soup base one by one. And for your question about “jiang” actually is different types of pastes for example peanut paste or sesame paste. Thoes different types of pastes are usually used in the dips for the hot pot. 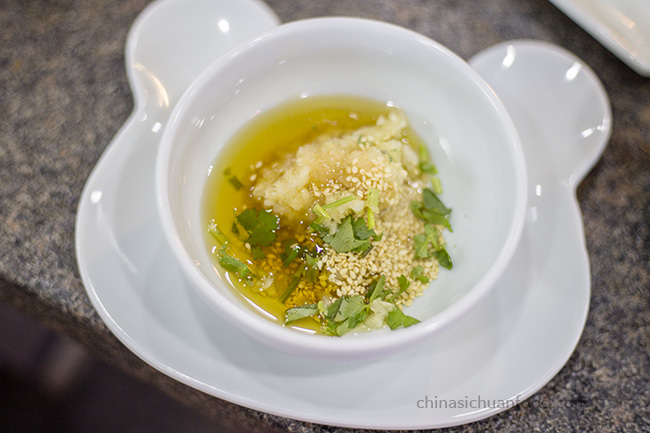 I have many sichuan dishes on the site now, I hope they can help to inspire. And surely I will bring more dishes belong to sichuan cuisine. Thanks again for your kindly comment. Bon Appetit! My grandparents are actually 華僑 and I living in Thailand right now. I went to studied Chinese in Beijing a couple years ago and that was the time I discovered the magic taste of Sichuan cuisine. I surly have heaps of questions to ask you and learn from you. Thank you so much that you creating this site to let the world see how fantastic Sichuan cuisine is. It is really nice to know that your grandparents are 華僑 and your support is so kind. I will work harder to bring the excellent sichuan dishes. I love them so much. If you have any question concerning about sichuan cuisine, let me know. I will try my best to provide information you need. You should start a food channel in youtube . I am sure you would go on to become a celebrity chef in youtube. Awestruck of your expertise in Sichuan cuisine. I was searching intensively for a good site for Sichuan cuisine ( I absolutely love it) , ad after a lot of search I am glad I found the best site that is out there. Thanks for all the wonderful recipes.God bless. Thanks Pal for your lovely words. I have the plan to build a channel in youtube and I absolutely love your suggestion. SO sweet and motivating. Thanks again. I made some Hot Pot yesterday , I followed your recipe , and added some Shaoxing Wine ( to give more depth to the flavors ) while making the sauce , and topped off the hot pot with lot of chilli oil . Turned out great . Thanks for the recipe . Unfortunately , did not pay heed to your advise of not taking the “soup” , and I am really in big trouble since yesterday 😛 , but it is totally worth it :D.
Btw , can you share a recipe for making authentic chilli oil ? I do make it in a very simple way and it is just not right , that is what I feel . I once saw some celebrity chinese chef , using three different kind of chillis for making chilli oil , and also using a lot of spices ( spring onion , star anise, fennel etc) . Thanks in advance . God bless. I am Ms. Sapana from Mumbai, India. I am a huge fan of Sichuan dishes specially Hotpot. I first time had it in Shanghai several years ago. I was living in Tokyo for a long time there I went to Hinabe i.e. hotpot restaurants nearly 2 times a month. Yes, I love it that much. After shifting to India last year, I miss it badly. I am trying to make at home. But want to make same as I used to have in Tokyo. I love the ShaoFeiYan version of soup bases white n red. Please let me know the ingredients required apart from you mentioned on your website. I don’t eat pork and beef so please let me know which substitutes to make. I have fresh chicken and fresh mutton available. Also please tell me how to make so thin slices of it. Also, the flat n thick noodles taste amazing at end of hotpot eating. I am not able to get them in India, could you please tell me how to make them at home? Thanks for stopping by and I am really happy to have you as a companion in the world of hot pot. However even in my hometown, different restaurants have their own recipes for making hot pot soup base and have slightly difference in the tastes with dips. So it would be hard for me to figure out the one you hade in Tokyo. I am sorry for that. Besides, I have never heard of ShaoFeiYan version in China since we do not have this restaurant or brand in China. Could you please provide some detailed description about that version? The thin slices of resturants are cut by machine. We are buying the cut ones avaiable in supermarket. Can you find them? For chicken meat, we do not need to cut it into super thin pieces! Only beef and mutton are needed to be cut into thin slices. Hi Elaine, Thanks for the reply. ShaoFeiYan is Little Sheep. In Japan they call it as ShaoFeiYan Hinabe i.e. Little Fat Sheep Hotpot (the same famous restaurant you mentioned in ur site). I tried to order their soup base packets online but its not shipped to India for some reason.So If you know their soup base recipe then please share with me. I like their white and red soup bases. Also the noodles I am talking about are available at Little sheep. 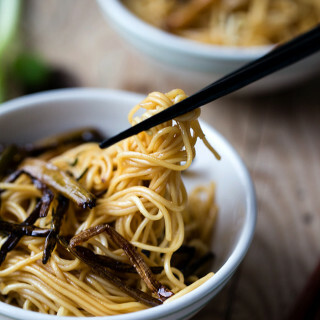 On searching on their website, I found that they call it ‘Fresh Thick Noodles’ in Japanese they call it Hiramen.It will be great if you can tell me how it make it. That make sense Sapana. Little sheep is a famous brand in China. I am sorry that I have not figure that out. We named it as Xiaofeiyang. I eat little sheep frequently and I never tried to make their soup base at home. Give me some time and I will try to help. As for the ‘Fresh Thick Noodles’, I further checked about it. Is it a kind of fresh made noodle which is wider than daily noodles? In China, we call it kuan mein. Hi Elaine, please let me know the little sheep soup base recipe in case you try. It will be wonderful. yes, the noodles wider than regular. At first I thought I will get all ingredients in India easily, but surprisingly its very hard to find the Sichuan spices here. I got few which are Indian versions. But I was thinking of buying from China online, from single website all original Sichuan spices required for Hotpot. So do you know any good website for online shop for the ingredients (which will ship to India)? Thanks. I will try to see the ingredients used in little sheep but our spring festival is coming so I will try to get it later. I am sorry that I did not find any websites in china that can ship to India. I suggest you to search some Chinese trade company in India to see whether they can provide those spices. And I know the noodles you are talking about. I will post a recipe so that you can make similar ones at home but it needs long time practice. And I am in the process of learning Chinese hand-pulled noodles. Hi Elaine, I am trying to find how to make the sesame dipping sauce. Do you by chance have a version of the recipe? I find the sesame paste at Asian store in the US but I don’t know how to duplicate the saltiness of the original. Thanks! There are some versions of sesame dipping sauce. Basically the sesame paste should be diluted with warm water and then add other ingredients for example sesame oil, sometimes fermented tofu etc. So would you provide me a little bit more information for example, what kind of hot pot you are eating when encountering with the sesame dipping sauce? What’s really matters. And I will be glad to help. Thanks for the reply Elaine. From what I remember, I had the type of hotpot similar to “Soup Bases –the basic soul of hot pot” picture. It was in Beijing. I had mainly lamb, beef and various vegetables. The dipping sauces was very salty and uniform in color and texture. This is all I remember. If you are eating this hot pot in Beijing, I guess I know the sesame dipping sauce you are referring to. It is not only sesame paste. It is a combined dipping sauce mainly with sesame paste. 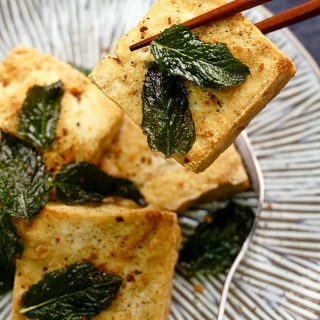 The special saltiness you mentioned is not bought by common salt but by pickled tofu(check here https://chinasichuanfood.com/pickled-tofu-fermented-bean-curd/). I list the basic recipe here and you can have a try. The amount is for one bowl. Add warm water to the sesame paste and stir in one direction until you get a pasty texture. Use a finger to dip in, and you will see the paste drops as a straight line. And then mash the pickled tofu and add into the pasty. Add other ingredients expect the sesame oil and stir in one direction. Final add the sesame oil in. Mix well. I was wondering if something happens if you eat the soup base? Thanks for the question. It depends! We do not eat most of the soup base because there are too much spices and oil.Soup bases are mainly for flavoring. However there some a few types of hot pot soup base can eaten such as mild lamb hot pot and mushroom hot pot etc. 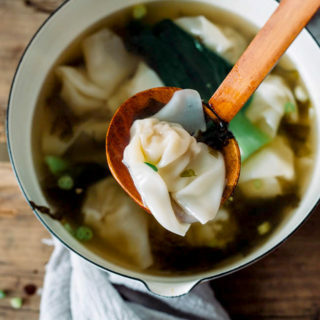 The most important thing is that if you love to drink soup base, you should drink it at the very beginning for healthy consideration. Thanks! I made the hotpot the other night and it was great! Thanks Katherine for the kind feedback. I am glad that it works well on your side. I really like the tomato broth I’ve had at Xiabu Xiabu and Haidilao . Do you have any idea how to make that? 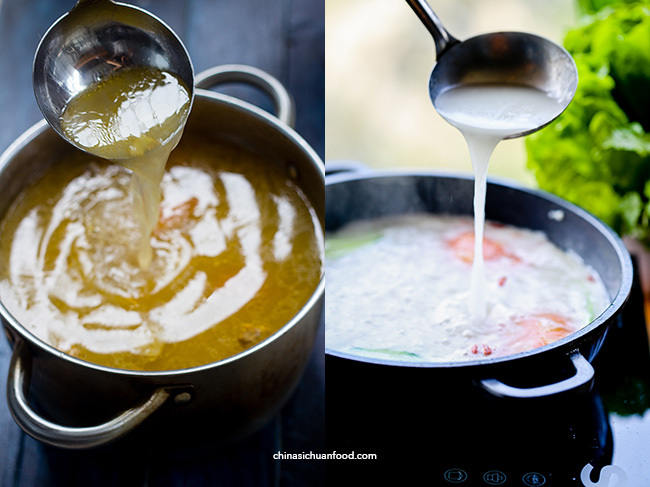 I have the plan to post a recipe considering about the soup bases from different brands. I get many readers ask via E-mail and comment. Please be patience with me. Hi. I stumbled upon your site while learning about Chinese hot pot. I’m actually a beef producer in Australia looking for beef markets in china. Hot pots has come up a few times as a common method beef is consumed. Can you give me thoughts on how mothers would buy beef for home hot pots in china? Would they buy a frozen product? Do they mainly buy beef sliced, meat balls and or dumplings? Would they perceive Australian beef as a premium product? Would some perceive low fat grass fed product as premium over fatty grain feed beef? I would appreciate any comments. I assume you are in USA but have strong roots in china? In fact, I am based in China. For Chinese hot pot, we always buy sliced beef because slicing really thin beef for hot pot is not a task that everybody can handle at home. Sometimes also buy some beef balls. But the most common one is sliced beef. As for the amount, I guess at least 500gm over 1 pound is needed for hot pot.Hot pot usually is for family gathering or social gathering. Usually we also match with some other proteins like pork slices and lamb. In the city where I am living, people love to buy imported beef because of the high quality. And yes, we think beef from Australian and New Zealand is of high quality. Of cause grass fed products are better than fatty grain feed beef. I hope those information can help in some way and wish you good luck in your business. Dear Elaine , Last time I’ve visited Chongqing , my family took me twice to a different kind of hot pot , it wasn’t spicy , and it was made with chicken and chestnut . Ever since , I am thinking of that recipe , It might have been the best thing I ever ate . Even tried a few times to cook but did not manage to fill the gaps . Have you any idea what is the recipe ? It might be slightly different to replicate the recipe exactly because there are indeed so many yummy Chicken hot pot at Chongqing. 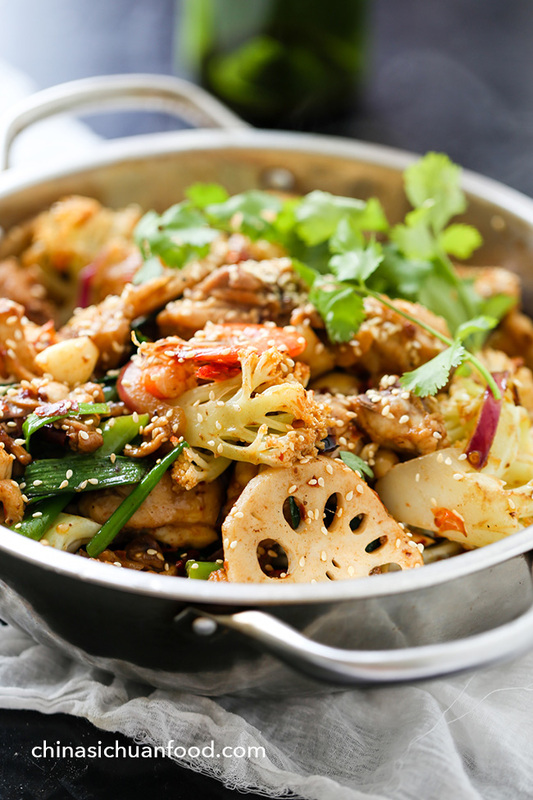 Do you mean Sichuan style braised Chicken? Are all the ingredients cooked already? With or without broth and dipping sauce? Hi Elaine, Great Recipes. Best ever. Do you know of any web site that sells the cooking pot with the chimney that you use in the hot pot recipes. Also what is that pot called. I am not sure what’s exact name. 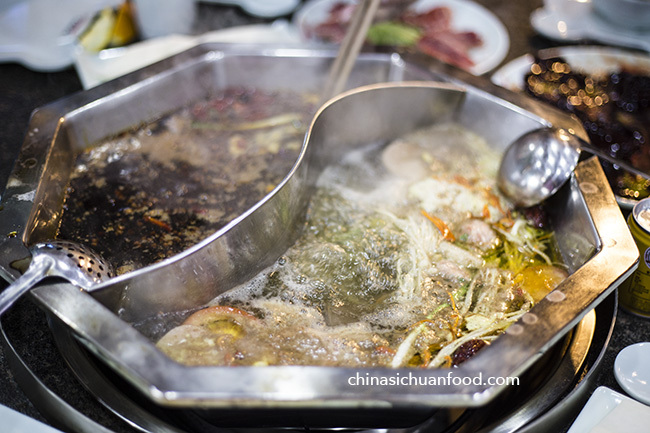 We call it old style hot pot pot, which is now still popular in many Beijing style hot pot and Yunnan style hot pot. We have them in special market selling restaurants tools and I do not know if it is available outside China. It might be named as copper pot. Try to see whether you can find some. If you really need it but unable to find satisfying product, I can help to source some in China. “Mongolian Chinese Hot Pot” and can be bought on :- http://www.aliexpress.com/store/209705 . PS> I have just tried your “Beef Chow Fun” absolutely brilliant. Thanks for the information Rebecca. I hope this will be helpful to those who need to have this equipment. i was just googling about hotpot and landed on your website… and now i am in love with it. the way you have expalined hotpot is really nice even for a new bird like me…we had visited HaideLao Hotpot recently and relished their tomato based soup. we are purely vegetarian and i would really appreciate if you can provide me with their recipe of tomato broth. i found it much oily so want to recreate it home. the pot came with a deep red broth, some chopped tomatoes, garlic stems… we loved corns, potatoes, lotus roots, firm tofu cubes, leafy greens n some kind of bread fingers in it. also please suggest how to prepare the dipping sauce with the ingredients available at the sauce counter.. Thanks for stopping by and leaving me such a caring comment. Haidelao is a good hot pot brand with excellent taste. I tasted it early in this year. You will need to stir fry peeled tomatoes with oil (you can use vegetable oil) and then add tomato paste to fry for minutes and then add water to simmer with garlic stem or scallion. The process is quite similar to make Chinese tomato egg drop soup. This soup is perfect for vegetables. I will test the details at home. I love Maocai so much when I was in Xi’an. It is called one person hot pot in China. The soup base is regular Szechuan style red oil soup base. There was a hole in the wall place in Kaohsiung, Taiwan 25+ years ago run by three old gentlemen. Old metal pans and open flame and the fish dumplings and especially the sacha were to die for. We went there all the time and every time we went back to Taiwan for a visit (usually every year), but then one year it was gone. My wife (a Taiwan native) and I have looked and looked and bought every brown paste I could find in an Asian grocery and can’t find anything close. It was a finer texture and had a little sweetness to it. It was so good. If only I could find the recipe. Can anyone help? Do you mean the shacha sauce? I believe the best shacha sauce comes from Bull Head. Have you tested that one? I usually use Bull head shacha sauce for fish and beef hot pot. I usually don’t comment on any websites ot blogs, except yours. I love everything about China! 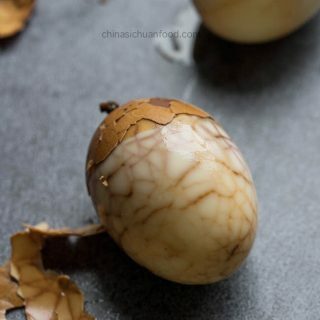 I’ve tried to find many traditional Chinese recipes, but they’re so hard to understand. Your recipes and photos make things easier for me to follow. Thank you for such a great job!! I have not had any chance to go to China yet. But I’m planning to go in the future! I’ve heard a lot about the food in Hangzhou. Hope you can post some Hangzhou dishes. Thanks for the warm comment. It really make me a day. And welcome to China. We have lots of yummy dishes here. 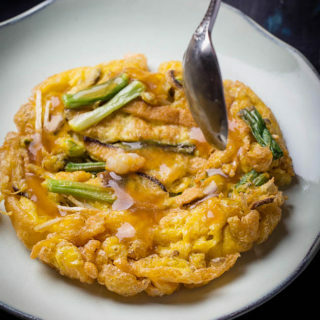 As for Hangzhou dishes, do you mean you want to know more about Chinese “苏” cuisine? I will try to expand the content to those regional cuisines when I have enough experiences. Happy cooking! lovely. I found perfect website for getting different types of cooking recipes. Amazing hot pot. I want to try it. Thank you for sharing an innovative dish. However, in addition to Chongqing hot pot, there is still a place where the hot pot has no reputation, but the taste is not inferior to Chongqing hot pot. That is the Zigong hot pot. First time I was in China late january 2004. It was a clear day but freezing cold. I walked arround in the streets in center of Beijing, I noticed many windows were kind of greyish from steam. Lots of steam. I didn’t know why, just thought they should do something about the heating system. Later HotPot restaurants become one of many favourites when I’m there. And as usual to dine in china is a very social thing and it’s so very cosy to sit with good friends arround a bowl with a tasty soup wether it’s strong og mild. 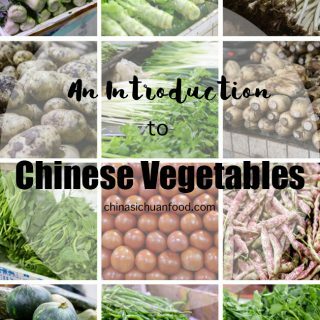 Yes, all types of hot pot has become my comforting food in winter and they are super easy to prepare comparing with other stir-fry dishes.